For my mom and godmother (who is visiting from Connecticut!!!). It was so good to spend girl time with them. And I also feel quite accomplished with my handy cooking skills. I made these cheesecake filled stawberries for dessert and they are TO DIE FOR. I'll do a tutorial at some point, but if you don't want to wait, here's the tutorial I used! While I'd love to tell you all about the food I made, I'm honestly too tired to do so. But on the bright side, my mom and I have decided that I will be cooking dinner often this summer! YAY FOR LEARNING HOW TO BE DOMESTIC! Anyway...on to Day Number Five! Here's the thing. I've had 2 boyfriends before T. The first one I dated when I was 16. Good guy, but he just wasn't the right one for me. It ended badly and I really haven't talked to him much since then. I honestly don't have anything to say to him. I have no hard feelings, I just barely even know him anymore. I dated my second boyfriend during my senior year of high school. It didn't last long. He's a totally sweet guy, we were just in very different places in our lives. He's really good friends with my brother now, and I've seen him a few times since we broke up. I have nothing against him either. If you could say one thing to an ex, what would it be? haha. tells how pathetic i am! i'm sure i could say some mean things too, but i'd much rather focus on the good! or, pathetic in my case. 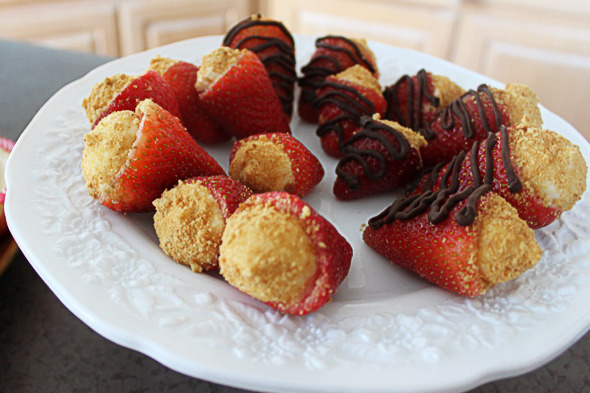 Cheesecake filled strawberries?? Are you kidding me? That sounds like heaven! Please send me some, ok? I so want those strawberries right now!!!! Your dinner sounds like fun - and dessert sounds delish, what a clever idea!